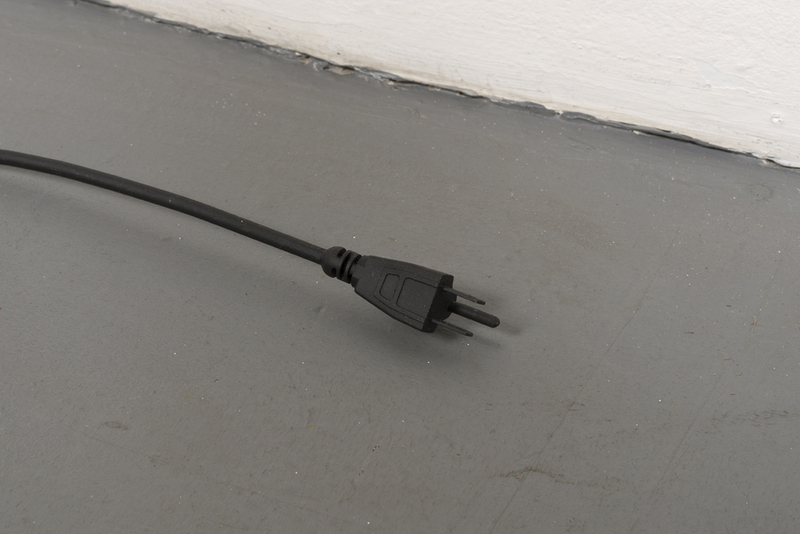 Monte Vista Projects is pleased to present Heather Brown's solo exhibition, Bedfellows. This will be the first public exhibition to show the artist's abstract oil paintings and figurative drawings together. In Brown's pen and ink drawings, figure drawing runs free and wild. Contour becomes form as lines shift from the description of an edge to the internal delineation of a shape. Schematic figures caress, climb, crawl, and strut and across the picture plane. Overlapping bodies ambiguously depict either sexual entwining, a collision of personalities, or a divided subject’s various selves. Brown’s distinctive approach to line has distant precedent in the improvisations of Surrealist practice, the early fashion drawings of Andy Warhol, and the wobbly satires of Saul Steinberg, but her tangled, loopy vision is entirely her own. Brown’s oil on canvas paintings in the exhibition conjure muddy labyrinths of portals, threshholds, and blocked passageways. 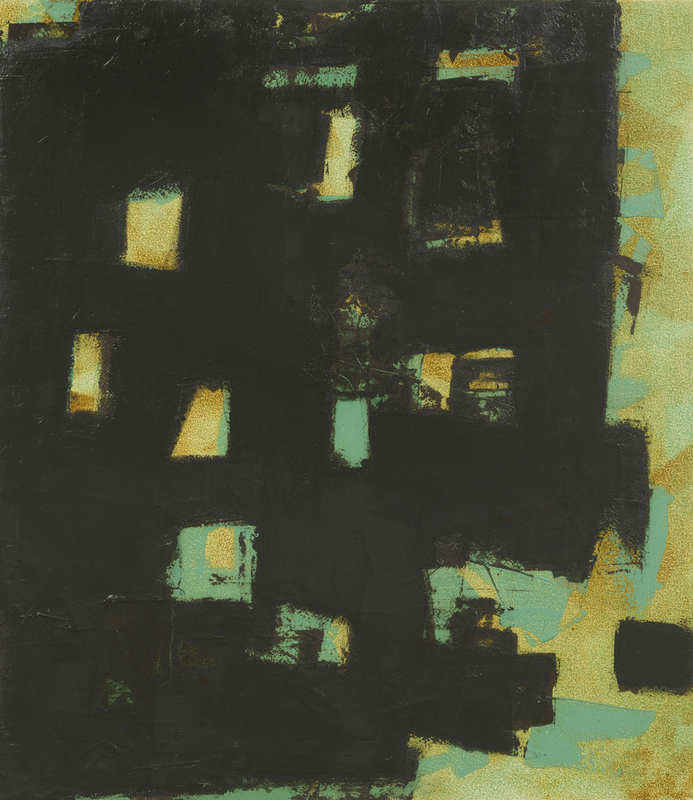 The compositions and paint application draw from the language of modernism, but instead of a purity of form, the viewer is offered a hardscrabble accumulation of brush stokes seen through a thicket of rubbings, scrapings, and reversals. Brown’s mazes of undo and redo perform an anarchical reckoning with the legacy of heroic geometric abstraction. Taken together, these two formally distinct threads of Brown’s practice enter a complex dialog, informing each other and also informing on each other. 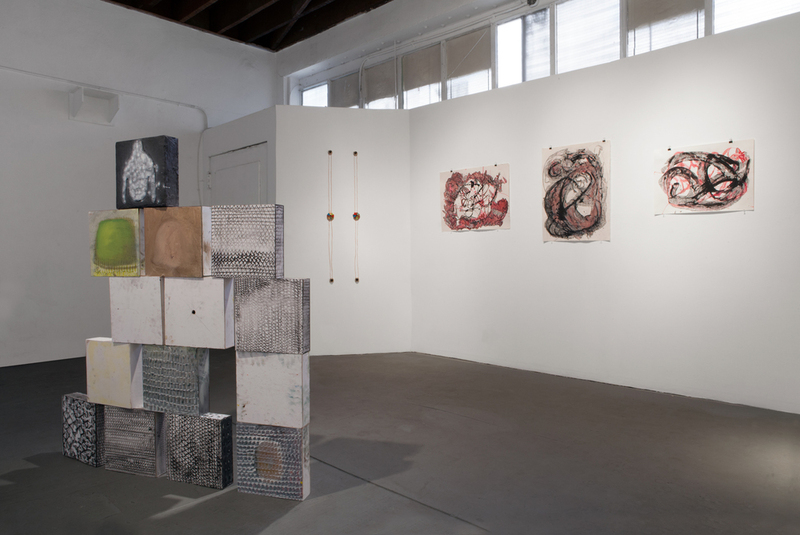 Heather Brownʼs solo exhibitions include Ruins; Carter & Citizen, Los Angeles, Thank You For Your Childhood; Parker Jones, Los Angeles, Drawings; Parker Jones, Los Angeles, and Heather Brown: New Paintings; Black Dragon Society, Los Angeles. Her work has been seen in group exhibitions at several other Los Angeles venues including Weekend, Five Thirty Three, Black Dragon Society, Honor Fraser Gallery, and Angles Gallery. She received an MFA from UCLA and a BA from UCSB. She lives and works in Los Angeles. "Do not underestimate objects, he advises Stice. Do not leave objects out of account. The world, after all, which is radically old, is made up mostly of objects." 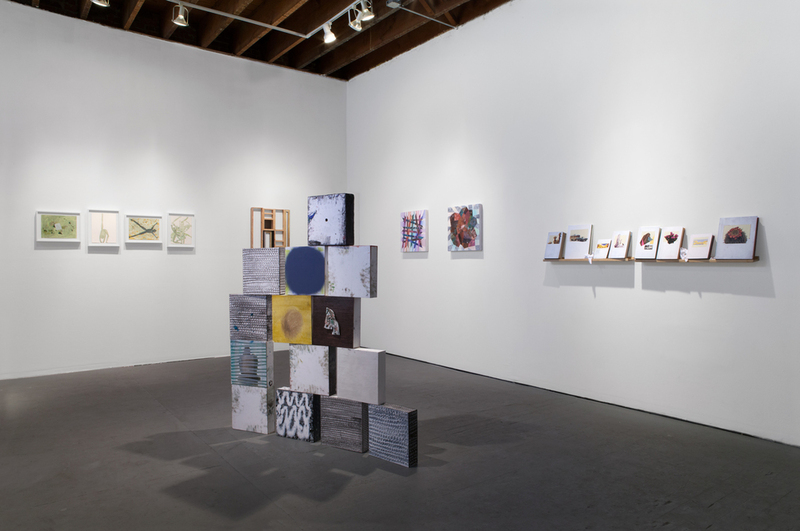 Monte Vista Projects is pleased to present A Good Wall, an exhibition of new work by Jason Kunke. A Good Wall consists of two related bodies of work, each considering how objects both submit to and resist our perception of them. Materiality is stressed and subverted in both bodies of work as a method to examine the gap between perception and the world itself, touching on issues of aesthetics and authority. 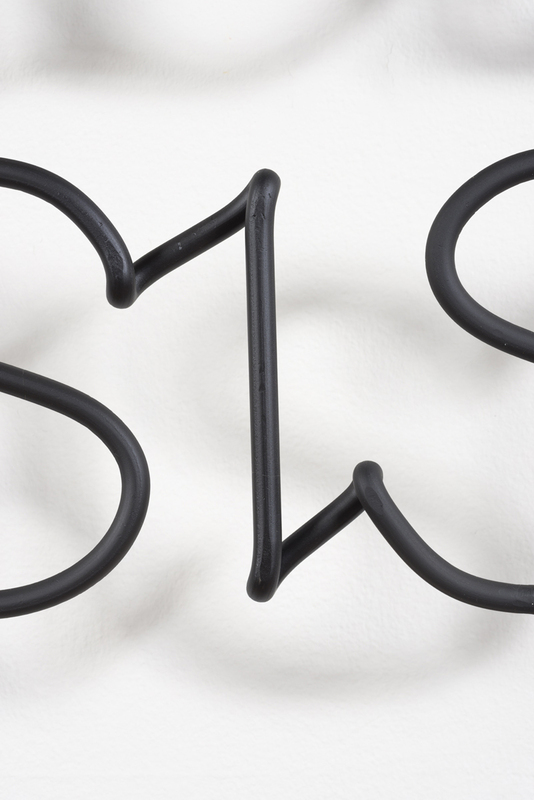 Grace Hartigan and Signature Strike are mimetic sculptures of neon signs, designed with the assistance of both neon sign and steel fabricators. Unlike real neon signs they do not emit light, but are finished in matte black to absorb as much light as possible, inverting the generous light of regular neon signs; instead of giving, the fake neon signs refuse. This refusal is emphasized in the words the fake signs display. 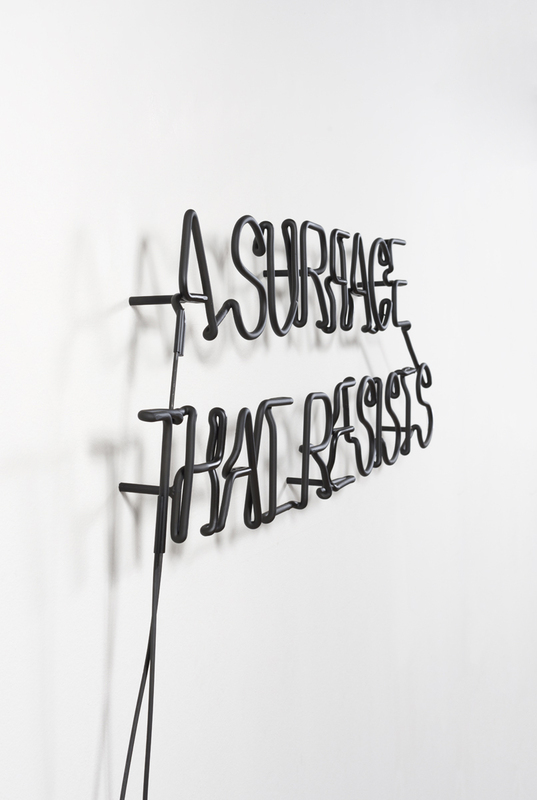 “A Surface That Resists”, is artist Grace Hartigan’s description of the AbEx notion of the subjective mastery of the world achieved through epic, transcendental objects. “Signature Strike” is a term from the vocabulary of drone warfare, describing a method of killing targets based on certain general characteristics rather than an actual identity. Considering how Abstract Expressionism was promoted during the Cold War by the U.S. government as a testament to American cultural freedom, these sculptures connect Abstract Expressionism and drone warfare, examining their shared strategy of generating and using objects to exert and disseminate power. Jason Kunke is a Los Angeles based artist whose practice includes sculpture, drawing, installation, video, and performance. 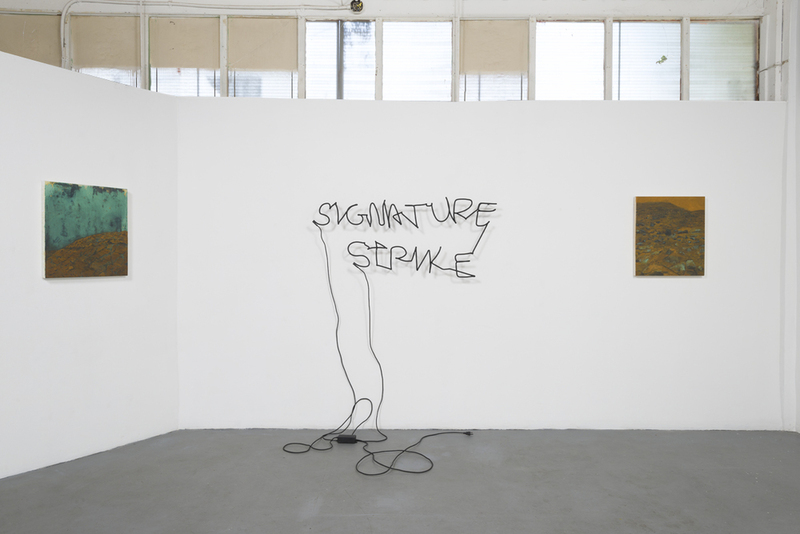 His art examines how authority and aesthetics inform each other. He received his MFA from CalArts in 2007, and his BFA (with a minor in sociology) from University of Houston in 2004. 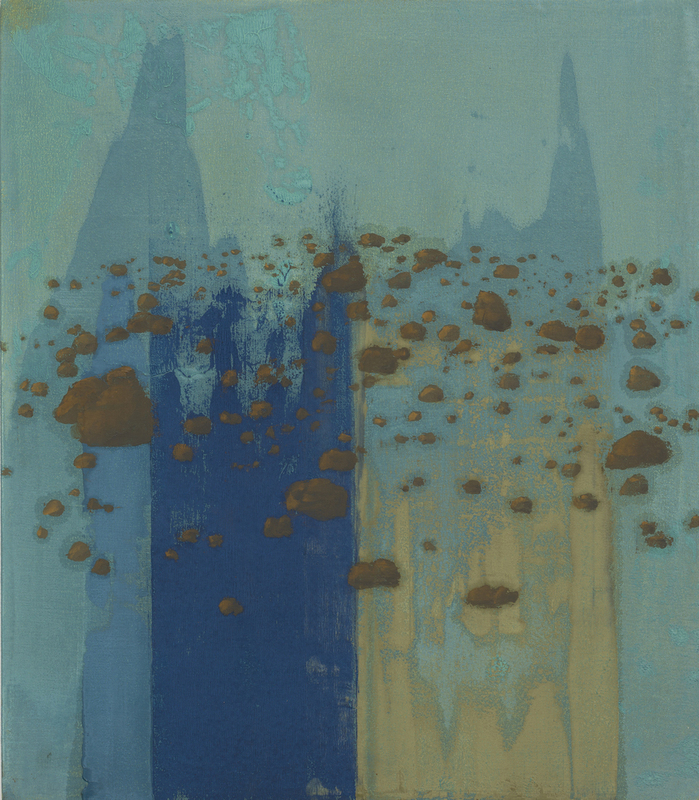 He has exhibited nationally at Polvo in Chicago, Commerce Street Artist Warehouse in Houston, and 25CPW in New York. In Los Angeles he has exhibited at Sea and Space Explorations, LAXART, and Dan Graham, and recently issued a limited edition print with Insert Blanc Press. Along with five other artists, he co-runs Elephant, an artist run space in Glassell Park. move through a room, passing your hand through every empty space. do some spaces feel different from others? what will you do if there is a hoop? maybe a swooshy 3 pointer? cheesy but still nice stuff. Opening reception on Saturday, May 23, 2015 from 6 p.m. to 9 p.m.
Exhibition runs until June 14, 2015. In FLOATING EDGE the two deviate from their typically collaborative practice and individually explore the literal and metaphoric meanings of ‘border crossings’ as a route towards change of identity and purpose. Their research reveals a complex relationship towards travel and cultural transmission; the need for shelter housed in worn clothing and for history held not in libraries but instead contained within the body. Cori’s work for FLOATING EDGE approaches the external necessities for crossing borders. Using a variety of camouflage for different geographic entryways, she creates ensembles that address the importance of rapid movement and basic shelter. Her clothing considers the competing need to be seen as Belonging, or as Other, and offers real questions about history’s mercurial relationship with migration. Sandra’s paintings and wool constructions for FLOATING EDGE take on abstract and symbolic form while they imagine multiple centers populated with geometric shapes – crisp borders merge with atmospheric skies, archetypal characters and radial symmetry to create a fantastical landscape suggestive of imminent change. Individually, the projects differently point towards forging new lives on the move. Together, the parts align and a larger whole emerges – a whole committed to unencumbered movement within a deeply rooted vision for the future. The event will take place on April 13th from 12:30 p.m. to 2 p.m.
By re-staging Tania Bruguera’s participatory art work, Taitlin’s Whisper 6, we stand in solidarity with her, Angel Santiesteban and Danilo Maldonado “El Sexto” and all other artists around the world who face criminal charges and violence for exercising their basic human right to free expression. As article 19 of the United Nations Declaration of Human Rights states, Everyone has the right to freedom of opinion and expression; this right includes freedom to hold opinions without interference and to seek, receive and impart information and ideas through any media and regardless of frontiers. Governments must embrace the rights of their citizens and non-citizens alike to share their voices, ideas, values, beliefs and dreams without fear of persecution or violence. As citizens of the world with a shared humanity, we urge the government of Cuba to drop all charges against Tania Bruguera, Angel Santiesteban and Danilo Maldonado “El Sexto” who are either imprisoned or facing imprisonment for doing what every person of the planet should be able to do: expressing themselves. -A small box (soapbox style) for the speaker to stand on. -People are invited to speak for one minute about freedom of speech. -Optional- If you want to you can include a WHITE dove, but do not to keep the dove on the shoulder as this is extremely difficult. Each person can hold the dove in their hands, and hands it over to the next person. Have a few… just in case they escape. -Please document events (either by camera or video) and post to the Creative Time Facebook page at facebook.com/creativetime, as well as on personal and, preferably, institutional Twitter and Instagram accounts, using the hashtags #YoTambienExijo and #FreeTaniaBruguera. Please indicate where the performance occurred and when. Monte Vista Projects is pleased to present The New Retail Mycology, an exhibition of new photographs by Benjamin Lord. The project explores notions of the made and the found, and how personal experiences are constructed and demolished in an age saturated by advertising. The photographs depict elaborate but ephemeral sculptural tableaux, conjoining the intentionality of highly wrought craft objects made by the artist with a range of scavenged materials whose provenance is more obscure. Reversing the customary assumption of a photographer’s studio as a place of rigid authorial control, Lord’s illusionary assemblages depict tenuous arrangements that walk a line between earnest handicraft and absurdist satire. Mushrooms and fungi appear throughout the project as both physical materials and as a deliriously mixed metaphor for spontaneous organic generation, the corporate branding of psychedelic experience, and the limits of scientific knowledge. Combining influences from advertising imagery, Japanese flower arranging, and the freeform juxtapositions of the internet, these images extend Lord’s longstanding interest in the illusionistic space of “sculptures” that exist only in the photographic imagination. Presented in candy-colored painted aluminum frames, Lord’s miniature worlds chart a space of freedom where the deliberate and the accidental mingle imperceptibly. The opening reception will be on Feb 7th from 6 – 9 p.m. The exhibition will run until 3/01/2015. Gallery hours are 12 -5 p.m. Sat and Sun or by appointment. Checkout review by Alicia Eler "When Consumer Goods Blossom Into Otherworldly Fungi"
Monte Vista Projects is pleased to present the most recent installment of Vinyl Potluck, a project by Tom Norris. Vinyl Potluck is an ongoing series which investigates our relationship with vinyl records and nostalgia. Attendees are invited to bring a vinyl record from their own collection and share with the group. The selection can be musical, historical, art-centered, or otherwise personally meaningful. A crate of records will be provided for those participants without records from which they may choose a selection. This record may then be kept by its selector, starting a new thread of nostalgia associated with both the vinyl object and the Vinyl Potluck event. Monte Vista Projects will be screening Nuttaphol Ma’s film A Grain of Rice Under A Microscope. The screening will be on Jan 10 and 11 from 12 – 5 p.m.
A Grain of Rice Under A Microscope. was inspired from an event that took place at a retail day job on a busy autumn Sunday in 2010. Nuttaphol’s co-worker approached him looking deeply distraught. She saw our managers watching their activities on the office's computer monitor. The artist woke up the following day feeling like a grain of rice under a microscope. In 2013, the artist set out to retrace his experience of that busy autumn Sunday. He performed an act of sitting and surveying in and around the premise of McDonald's to mirror the 8 hour shift of the workers behind the counter. Two rolls of B/W super 8 film were deconstructed to shoot one frame for every four seconds in order to captured my 8 hour sitting where I recorded unfolding events and conversations that occurred between management, myself, and two police officers. The film is a poetic experience that slips between work and memory, protest and meditation, surveillance and watcher. Nuttaphol Ma’s multidisciplinary works align his dreams, consciousness and memories to compose stories about the dreams of leaving and dreams of roots, the longing and not BE longing. Ma connects the seemingly disconnected patterns and sequences of unfolding moments from the everyday to re-tell empowering stories of belonging and not longing, about flowers blossoming from solitude. Ma currently runs a nomadic self-imposed sweatshop entitled The China Outpost that migrates throughout Los Angeles. 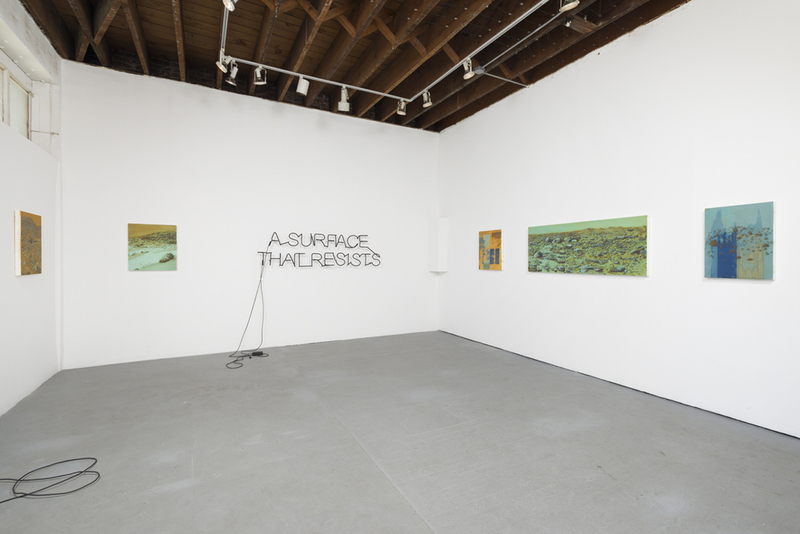 Ma has participated in numerous exhibition spaces throughout Los Angeles including: 18th Street Art Center, The Armory Center for the Arts, Pitzer College Lenzner Gallery, Los Angeles Municipal Art Gallery at Barnsdall, The Fellows of Contemporary Art, Angels Gate Cultural Center and Freewaves. Through the generous support of the Los Angeles art community, Ma is a recipient of the following fellowships and artist’s residencies: Armory Center for the Arts Teaching Artist Fellowship, California Community Foundation Fellowship, The Feitelson Arts Fellowship, Pitzer College Emerging Artist Fellow, 18th Street Art Center Artist Fellow, The Mountain School of Art Residency, the Richter Watson Fellowship Fund and the Walker / Parker Memorial Fellowship.